When inspecting eggplant for internal defects, randomly select and cut, a minimum of two fruit for packages containing 15 fruit or less, cut a minimum of four fruit for packages containing more than 15 fruit. If no defects are found it will not be necessary to continuing cutting. However, if defect(s) are found cut the remainder of the sample. I would agree with this procedure if you were finding internal discoloration on a regular basis, affecting your eggplant. 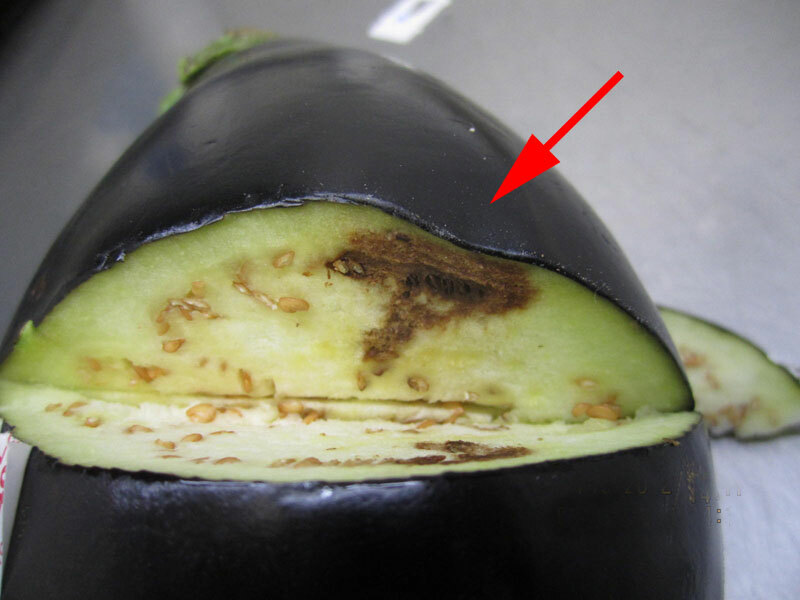 In my personal experience I have seen internal discoloration affecting eggplant every now and then. For this reason, I suggest only to cut 1 to 3 eggplant during your entire inspection process, not 2 or 4 eggplant per sample. I’d hate to see an inspector wasting their time and destroying 2 eggplant per sample, looking for a defect that is rarely found. You will find most if not all USDA inspectors ignore this cutting procedure as well, as they use common sense in deciding whether to cut the specimens. 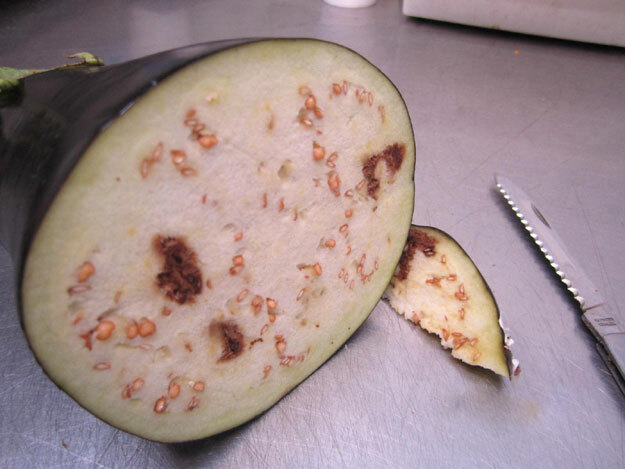 If they are finding internal discoloration they will cut more eggplant, if they do not find internal discoloration they will cut only a few eggplant throughout their inspection. Internal discoloration may be found affecting the flesh resulting from a bruise, or it may be a physiological disease, exhibiting no external indication of internal discoloration. As you can see in the image above, this type of discoloration is impossible to detect, without cutting. If you find this discoloration you must also verify if the discoloration is turning into decay, becoming soft, or mushy. If the discolored area is firm and dry, the USDA has developed a specific scoring guideline. What may seem very lenient, the USDA allows an aggregate discolored area of 1 inch in diameter before it is scored as a defect against the U.S. No. 1 Grade. If the discolored area is soft and mushy (decay), then it is considered a free from defect, meaning any amount is scored as decay. In this eggplant, shown above, the discoloration is caused by the bruise, as the flesh was injured and became discolored. Always check under the surface of bruised areas to determine the extent of the damage. The same 1 inch scoring guideline is used for scoring discoloration caused by bruising.